Marc Miller says it's a result of a "personal journey" he embarked on to promote indigenous languages. Liberal MP Marc Miller delivered a statement in the House of Commons Thursday entirely in the Mohawk language — the result of a "personal journey" to raise awareness of indigenous languages in Canada. 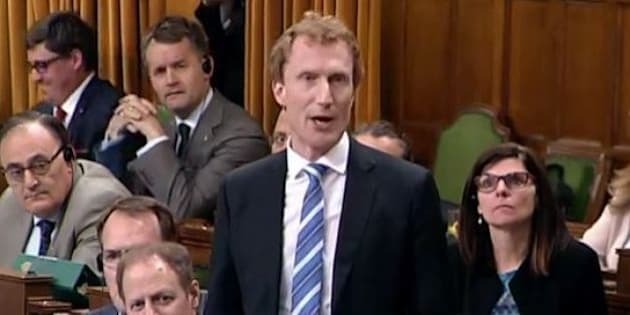 "Today, for the beginning of Aboriginal History Month, I spoke to the House in Kanien'kéha, the language of the Mohawk people on whose traditional land my riding is situated," Miller said in a Facebook post that included footage of his statement. "I hope to have inspired a few people to learn an indigenous language!" I pay my respects to you who have gathered here. I stand here to honour the Mohawk language and I pay my respects to their people. Let us pay respects to the Creator for everything he has given to us that we may live peacefully. Miller, a non-indigenous MP who represents the Montreal riding of Ville-Marie — Le Sud-Ouest — Île-des-Soeurs, told CBC News he decided to learn the language to embrace the heightened focus on reconciliation after Canada's residential school inquiry. Miller added he expected skepticism when he approached the teachers at Onkwawenna Kentyohkwa, a community-based organization in Ontario that teaches Kanyen’keha to adults. "I always thought they'd laugh at me and say, 'Is this guy ridiculous? Who is this clown?'" Miller said. "But it's been the opposite. It's been extremely positive." Akwiratékha’ Martin, an instructor at Kahnawake’s Mohawk immersion school, told the Montreal Gazette Miller's effort was "very respectful" and hoped his undertaking will push the federal government to support more indigenous language programs. Miller's statement marks the first time an MP has delivered a statement in Kanien'kéha in the House, according to the Gazette. Last month, Liberal MP Robert-Falcon Ouellette stood in the House to deliver a statement in entirely in Cree to discuss acts of brutality against young women in the Prairies. Like Miller, he had to provide his own translation. Around 25,000 North Americans identify as Mohawk, according to the New Yorker, with only about 15 per cent of them able to fluently speak the language.